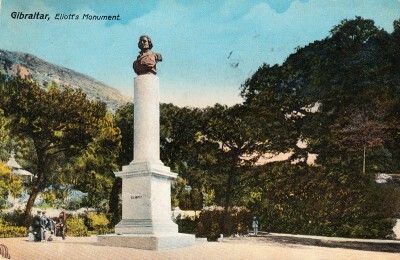 Gibraltar was known to the ancients as Mons Calpe, one of the Pillars of Hercules. Ptolemy first determined its latitude, and the correctness of his calculation is corroborated by the observations of the present day. The conspicuous form and isolated position of this rocky promontory, which stands like Nature’s monument with all its rugged steeps at the entrance to the Mediterranean Sea, made its name familiar to ancient navigators, and we find the Rock referred to and described by both Greek and Roman writers. The ‘Rock’ is less than three miles long and less than a mile wide but has been argued over for a very long time. 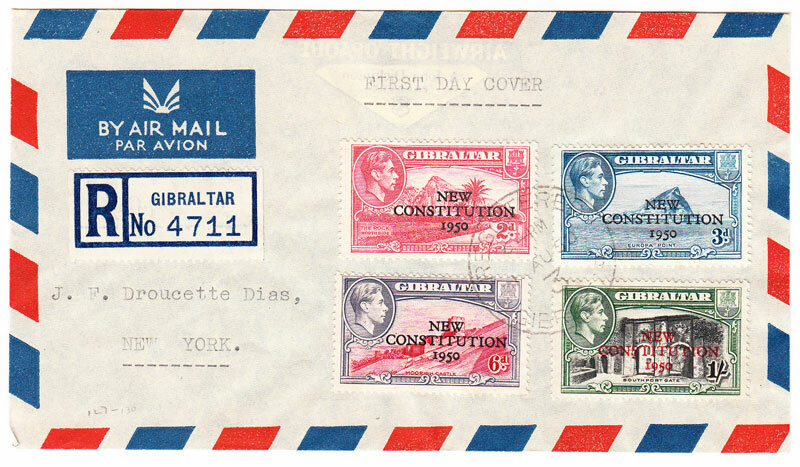 Currently it remains today as a British Overseas Territory. It rises to around 1400 feet and is made of Jurassic limestone. 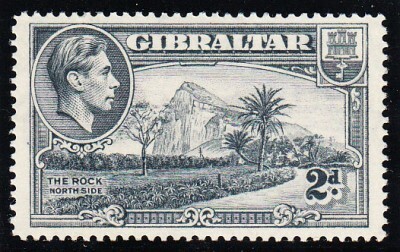 Gibraltar had been a Spanish possession until the early 18th century but in 1704 a combined Anglo-Dutch force, in support of Charles III, took the rock into British rule. During the 18th century there were three sieges including the Great Siege between 1779 to 1783 and many of the defences still survive today. In 1848 within a cave on the north face of the rock they found the skull of a woman. These remains were later known as Neanderthals after a similar skull was found in Neanderthal (Neander’s Valley) in Germany. 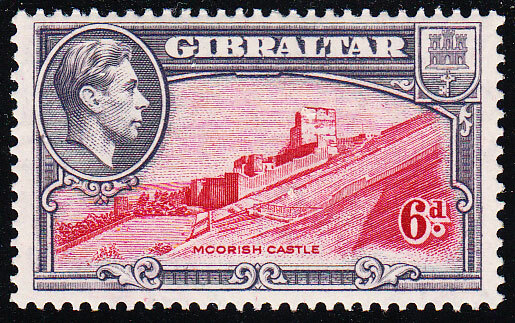 World War II saw Gibraltar being used as the navel base for the Mediterranean Task Force and as a stop for supply convoys. 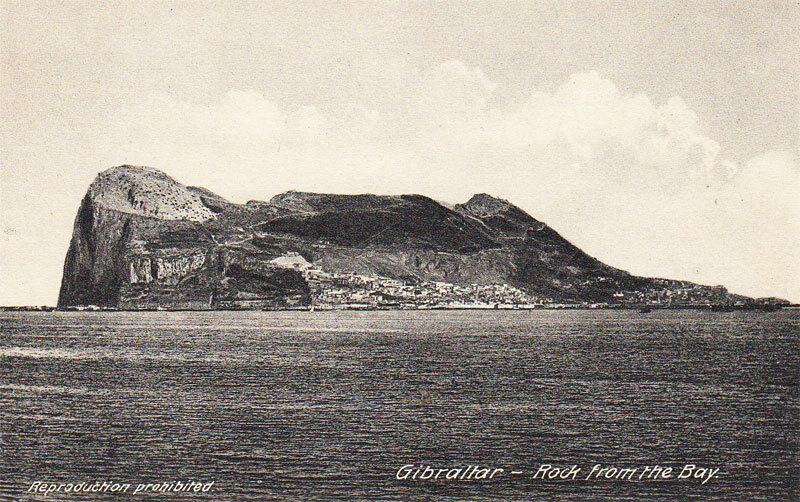 They also built a solid surface runway and the rock became a major fortress with tunnels to store guns and ammunition as well as to provide a hospital and barracks. With the Multiple Script CA watermark the first of these stamps were released on 25 February 1938 and printed by De La Rue. 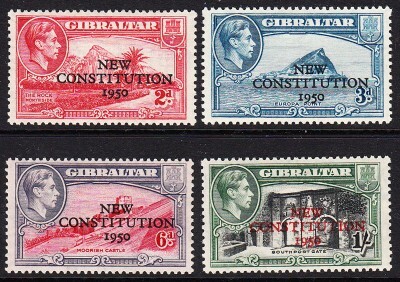 There are a great deal of variations in the KGVI stamps, with differing colours, watermark alignments and perforations. I will focus mainly on showing the designs for the most part but will mention some varieties too. 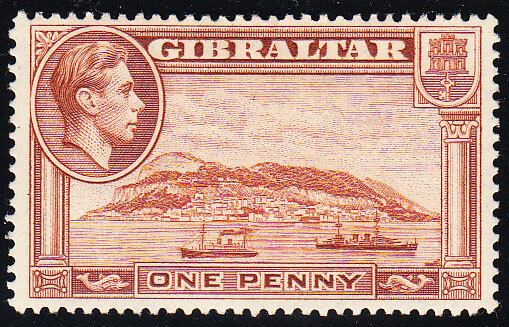 Skipping first to the 1d brown value; this is the ‘Rock of Gibraltar’ design, which as mentioned above was first used for his father’s stamps. It comes in various colours from pale browns to dark chocolate browns and perforations 14, 13 ½ and 13. 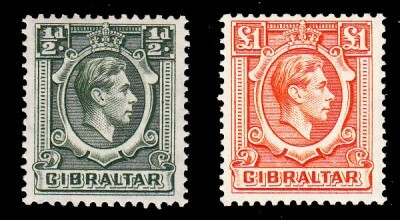 The same design was used for the 1½ d carmine (P 14 & P 13½) and the 1½ d violet (P 13). 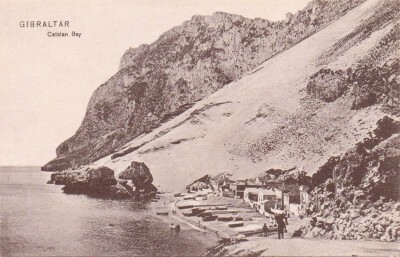 This scene would seem to be from the bay as per the old postcard. 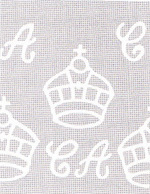 Turning to the 2d grey, this was produced in perforations 14, 13½ (also with sideways watermark and a high catalogue value), and perforation 13. 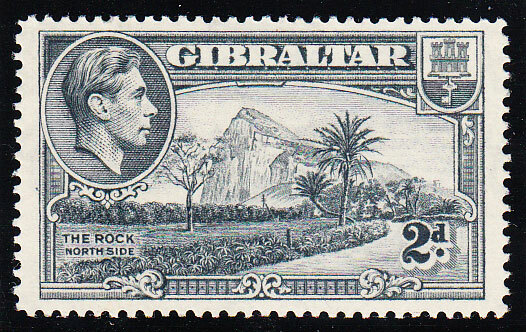 They again reused the design in 1944 this time as the 2d carmine – here the view is of ‘The Rock Northside’. 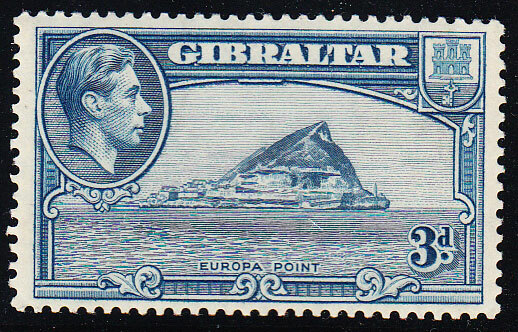 ‘Europa Point’ is featured on the 3d light blue stamp which was produced in perforations 13½, 14 and 13. 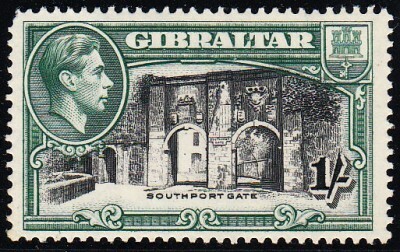 The perforation 13 is also listed in a greenish blue colour by Stanley Gibbons. Like before the view was used again for the 5d red-orange of 1947. 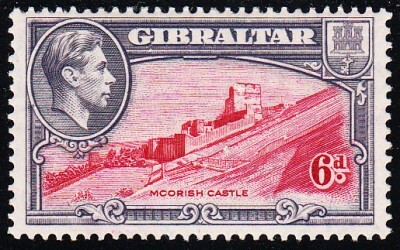 For the next design we have the Moorish Castle on the 6d carmine and grey-violet which was first issued 16 March 1938. 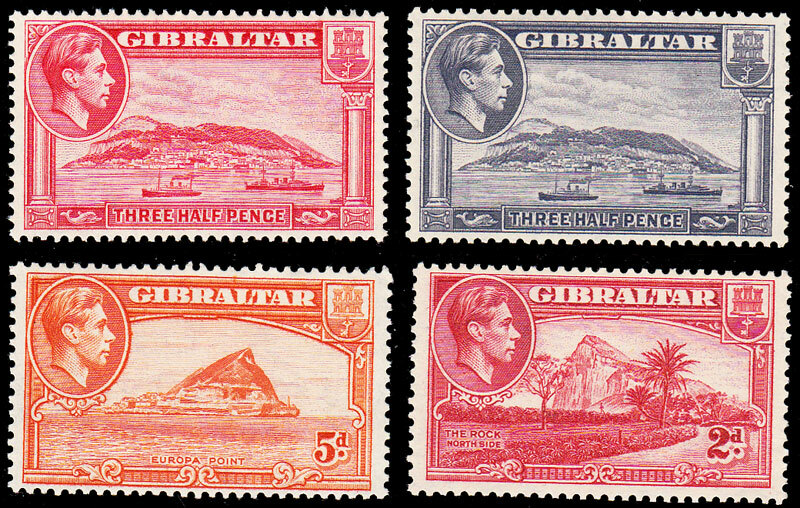 The different perforations were 13½, 14 and 13. 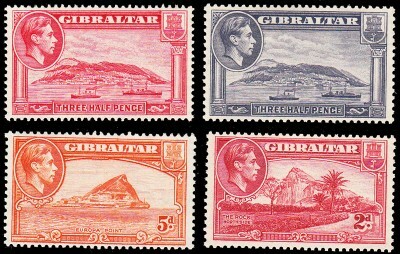 There is also a scarlet and grey variety (1945) as listed by Stanley Gibbons. 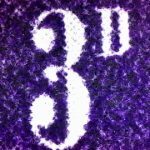 This design was only used on the 6d value. The castle dates to the Medieval period with the most prominent feature being the Tower of Homage. It makes for a dominant and strategic position. 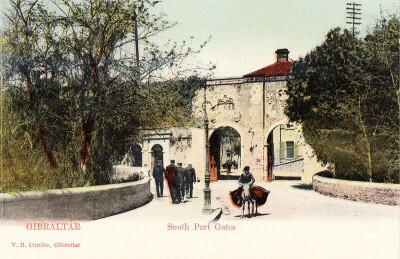 Next up is Southport Gate in black and green for the 1/- value. Perforations were 14, 13½ and 13. 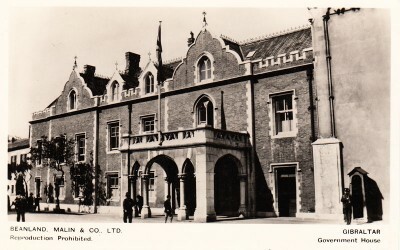 Underneath it is the gate shown on a picture postcard. Now consisting of three gates, built at different periods, within the Charles V Wall which dates to the 16th century. 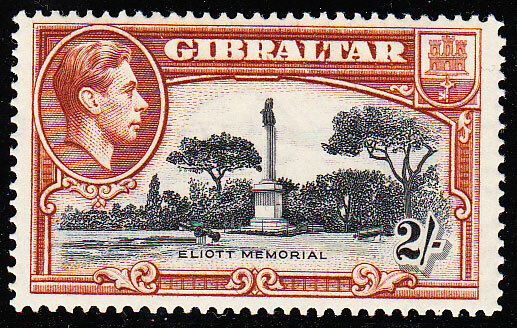 For the 2/- design, Garrood chose the Eliott Memorial. Perforations were 14, 13½ and 13. Colours black and brown. George Augustus Eliott (1717-1790) was a British Army officer noted for his defence of Gibraltar during The Great Siege. 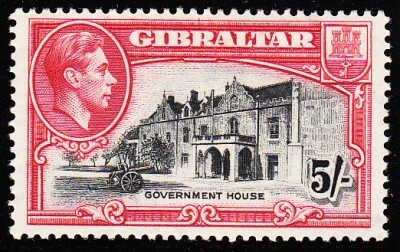 The 5/- features Government House in black and carmine. Three perforations were made; 14, 13½ and 13. 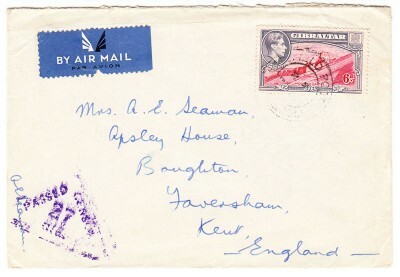 This particular postcard is one from Beanland Malin & Company that inspired the design. 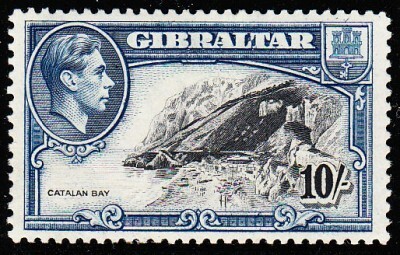 The last of the pictorials is the 10/- showing Catalan Bay in black and blue. Just two types of perforation this time – 14 and 13. Finally here the ½d green and the £1 stamps simply feature the King’s portrait. 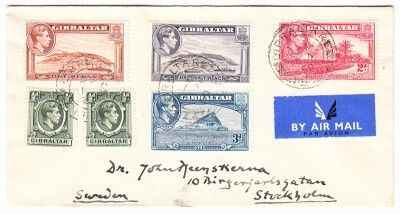 Both were perforated 13½ x 14. For completeness; shown above are the other colours and values mentioned earlier with repeat use of the designs. Next I will show some examples on cover with different features and rates, I think they make for attractive items. 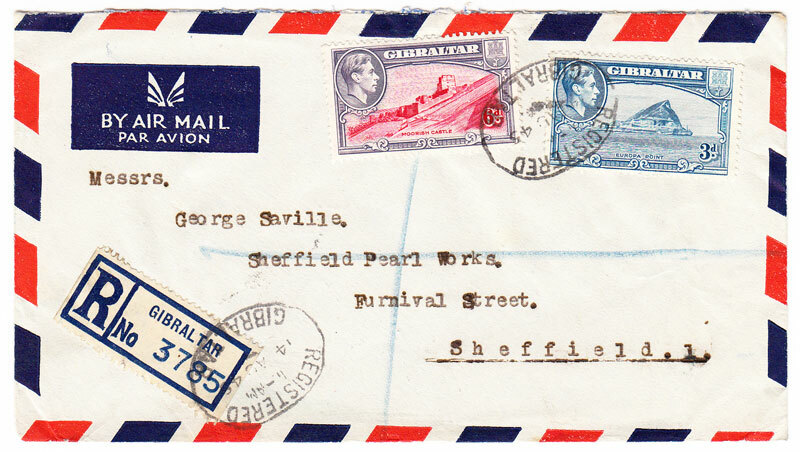 Due to the war the civilians were evacuated to Britain, Jamaica and Madeira. 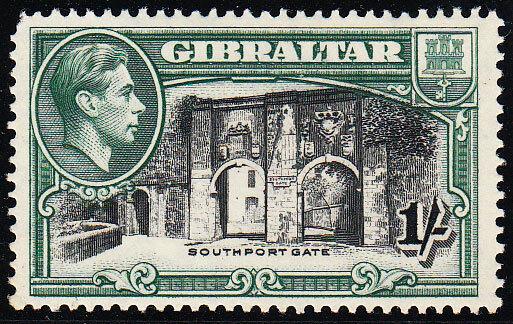 Gibraltar was fortified and by 1942 there were over 30,000 servicemen and women stationed there. Two examples above of a circular type censor mark in different colours. 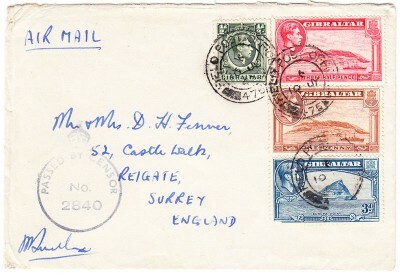 These were posted in 1943 and the face value of the stamps is 6d as expected. They are cancelled with the Field Post Office circular date stamp. In an effort to show a clearer image of the Field Post Office cancellation I traced one out in Photoshop. Field Post Office 475 opened 2 December 1940. 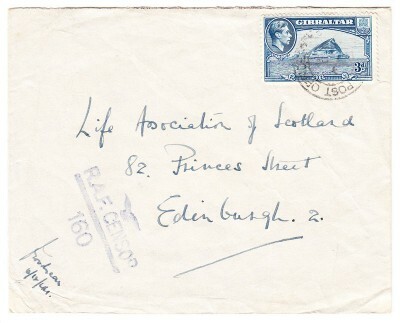 Note that this cancellation was still in use for some time after the war ended. Office 475 closed in 1947 but the date stamp was kept and was then used by the civilian post office to cancel force’s mail as can be seen above. Above we have an example of a registered letter to Sheffield in the UK, dated 14 August 1945. 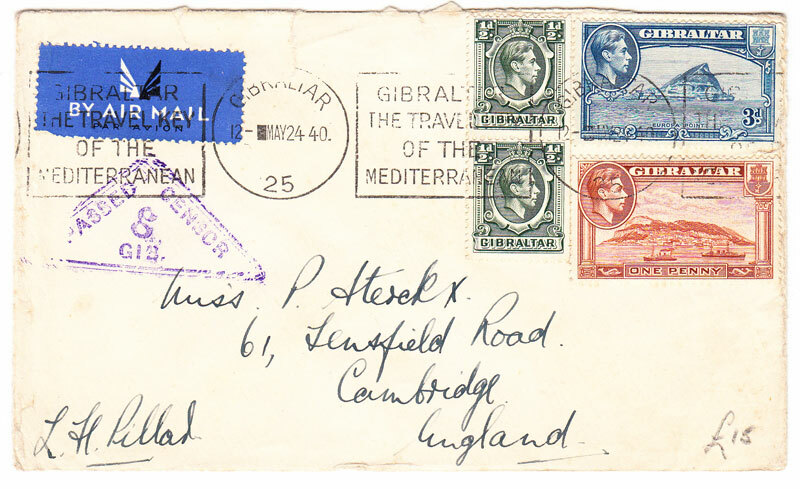 Here we have multiple stamps on a cover to Stockholm, Sweden, marked with Gibraltar CDS on 18 April 1950. The face value of the stamps is 8½d. Air Mail rates from 1 June 1949 to Europe was 5d for the first ½ ounce and 3d for each additional ½ ounce. If this weighed up to 1 ounce then it’s ½d overpaid. 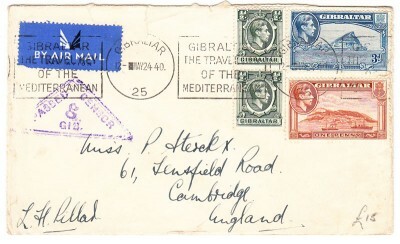 But more likely it was simply to gain the stamps on cover, also suggested by the arrangement. 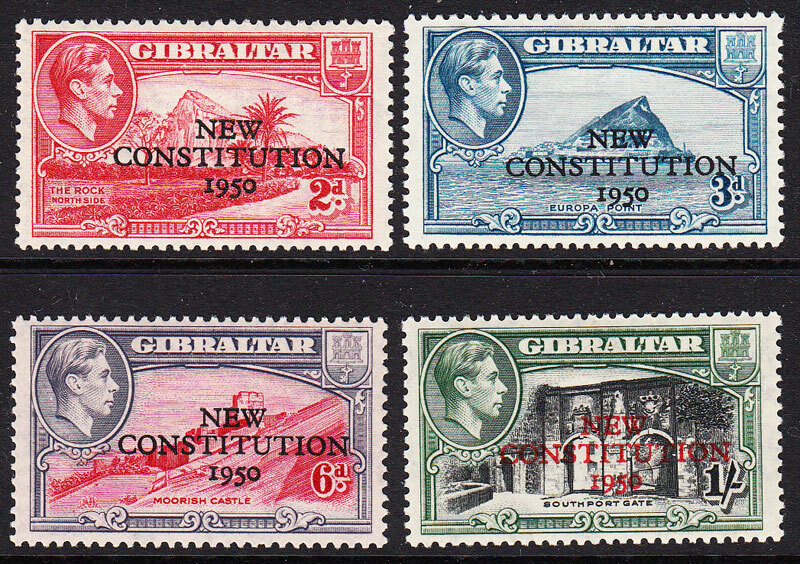 For 1 August 1950 these four values; the 2d, 3d, 6d and 1/- were overprinted in commemoration of the Inauguration of Legislative Council. The shilling being in red ink. 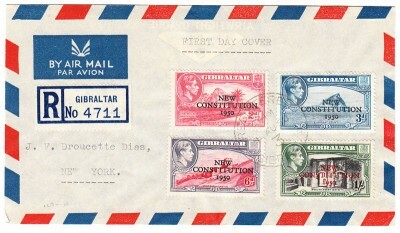 Finally we have the New Constitution set on a registered First Day Cover, sent to New York and dated 1 August 1950. The People of Gibraltar website – Beanland Malin and Co – 500 000 Postcards. 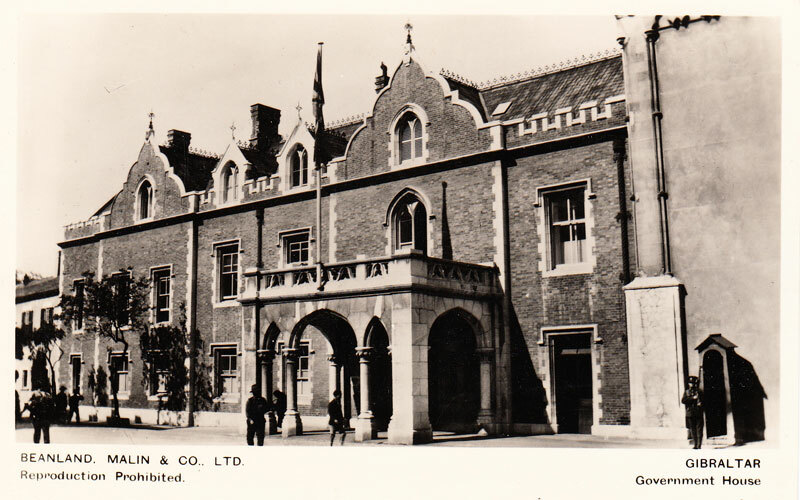 Quoted from Wikipedia – Government Houses of the British Empire and Commonwealth. Quoted from Wikipedia – Catalan Bay. 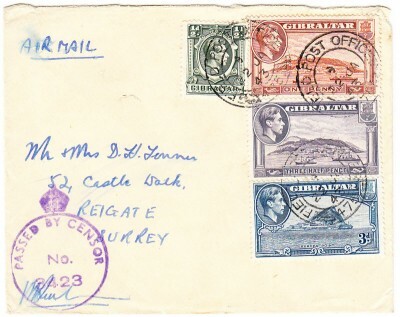 According to The postal history of Gibraltar 1704-1971 – Garcia & Proud. 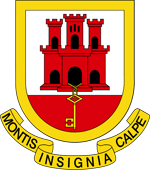 Quoted from Wikipedia – Political development in modern Gibraltar. 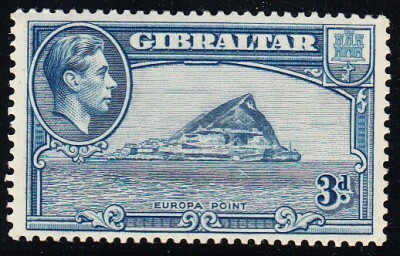 The history of Gibraltar and of its political relation to events in Europe. With original letters from Sir George Eliott, Admiral Collingwood, and Lord Nelson (1865) by Frederick Sayer F.R.G.S. [Free PDF]. 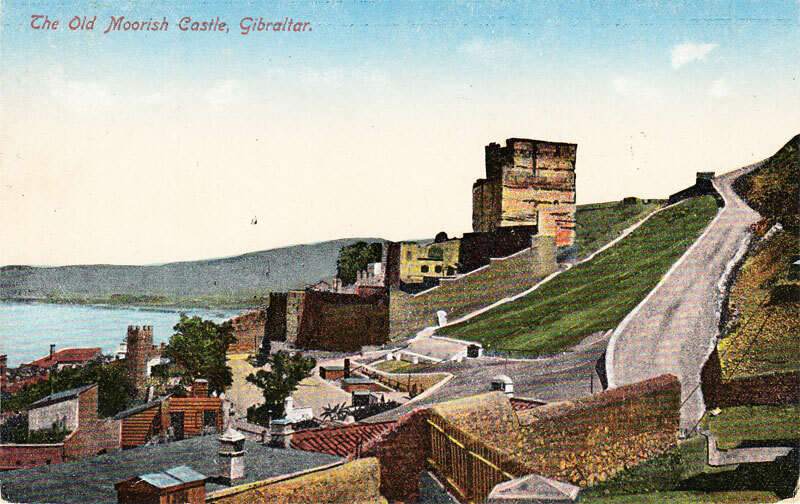 Gibraltar: The History of a Fortress by Ernle Bradord. The Fortifications of Gibraltar 1068-1945 (Fortress) by Darren Fa & Clive Finlayson. Community and Identity: The Making of Modern Gibraltar Since 1704 by Stephen Constantine. Timeline of the history of Gibraltar at Wikipedia. Gibraltar Study Circle – with available publications in the shop. 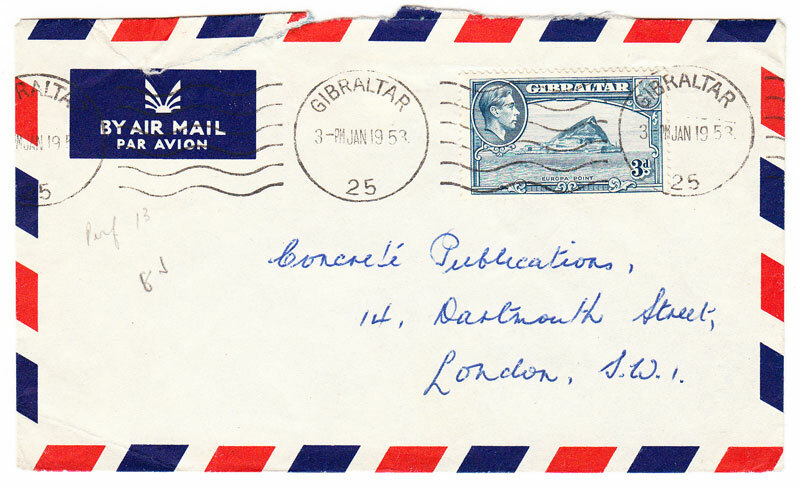 The postal history of Gibraltar 1704-1971 – Garcia & Proud. I really enjoyed seeing the illustrations on the postcards and comparing them with the vignettes on the stamps. Although I am not a member of the Gibraltar study circle I know that a paper on King George VI stamps have been published by them. Yes I think they have released a few papers. I am going to sign up with them at some point, it’s not too costly. 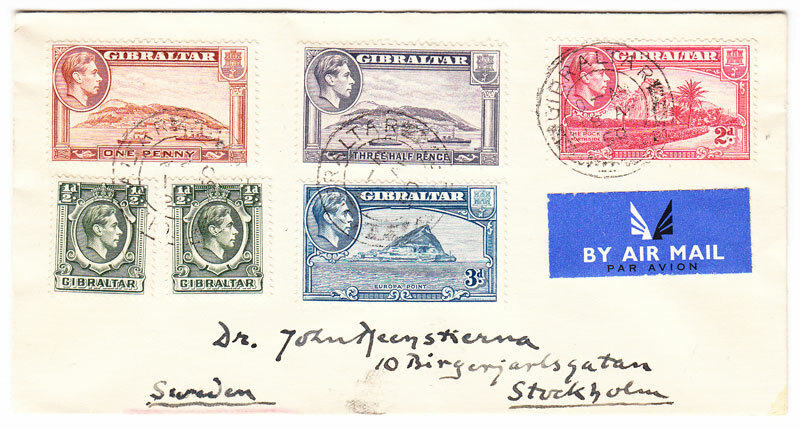 I did buy a book from them called ‘Gibraltar – Collecting King George VI’, maybe this is what you are thinking of ? But thanks for reminding me, I will add a link for further reading. Thanks for the heads up. I did think this was a strange comment, now I know why. Cheers. I’ll leave these comments here as they document the spamming enough to indicate to others what to watch out for. It’s good that at least they stopped their practice, well done for outing them.